A Texas-size Solution to a Texas-size Challenge | Texas Shafts, Inc. When the LBJ Freeway (also known as Interstate Highway 635 or I-635) in Dallas, Texas opened in 1969, it was designed to handle 180,000 vehicles per day. Current traffic counts estimate 270,000 vehicles per day on the LBJ Freeway, and, based on that traffic count, there will be over 500,000 vehicles per day by 2020. Enter the Interstate Highway 635 Managed Lanes Project (LBJ Express Project). Described by state transportation leaders as the most comprehensive and complex project of its type in the country, the approximately 17-mile project encompasses improvements along I-635 from Luna Road to Greenville Avenue, as well as on I-35E between Loop 12 and Valwood Parkway. These long-awaited improvements will dramatically expand the capacity of the current road, relieving traffic congestion for millions of North Texas commuters each year along these major corridors. The overall project will combine the same number of general purpose main lanes that exist today with continuous frontage roads along with approximately 13 miles of new express managed toll lanes. Drivers will have the choice to remain on the free main lanes or to use the new high-speed, express lanes with adjustable toll rates, initially set in accordance with a methodology established by the North Central Texas Council of Governments. Construction began in early 2011 and is on the fast track for completion by early 2016. The LBJ Express improvements will be designed, financed, built, operated, and maintained by the LBJ Infrastructure Group (LBJIG), which was selected for the project by the Texas Transportation Commission (TTC) after a rigorous and competitive public bidding process. transportation infrastructure, and Meridiam Infrastructure, an investor in public-private partnerships (P3) around the world and developer of public facilities. LBJIG partners also include the Dallas Police and Fire Pension System and Trinity Infrastructure LLC. What makes the LBJ Express Project unique is that drivers will have a choice to bypass the congestion on the main lanes by using the new managed toll lanes. The project is planned to have one of the most comprehensive and complex system of managed toll lanes in the country. It is the first Texas Department of Transportation (TxDOT) solicited Comprehensive Development Agreement (CDA) project in the region. Because the cost of the overall project exceeded the total amount budgeted for TxDOT’s Dallas Division fivecounty area through 2016, a CDA was required. The CDA is a public-private partnership that gives transportation agencies the money, innovation, and resources needed to build projects. In Texas, CDA’s are awarded to a team of companies that provide any combination of finance, design, construction, maintenance, and operation services under TxDOT guidelines. The LBJ Express Project is led by Cintra US, the Texas based arm of Ferrovial, based in Madrid, Spain. The LBJ Express is a massive, multi-faceted construction project, requiring a variety of skills and capabilities. The project has already created hundreds of jobs in North Texas, and is expected to generate more than 2,000 total jobs by the project’s completion. Some 100 private companies are employing their knowledge and skills as subcontractors on the LBJ Express project, one of which being ADSC Contractor Member, Texas Shafts, Inc. The project is broken up into multiple segments, and Texas Shafts has been working on each: Segment 1 (5.8 miles) on I-35 East from south of Loop 12 to south of Valwood Parkway, and Segments 2 and 3 (10.7 miles) on I-635 east of Luna Road to Greenville Avenue. Texas Shafts’ role in the project includes the installation of over 5,300 drilled shafts for the bridge structures and retaining walls. The drilled shafts range from 18in to 120in in diameter for a total length of more than 262,000 linear feet using about 144,000 cubic yards of concrete. Texas Shafts’ scope of work includes the installation of all drilled shafts for structures and retaining walls. Excavation for these shafts will be as required through all materials encountered to the dimensions and elevations shown on the plans or as required by the site conditions. Place furnished reinforcing cages. Furnish and place concrete. Typical for the Dallas area, the general subsurface conditions are variable between soil borings. The previous worksite fill includes rotten top soil and trash, and many sections contained water soaked fill material requiring wooden mats to support the equipment. Segment 1A-South End by Loop 12: Below the surface fill layer, the underlying soils include fat clay, sand, and sandy lean clay of varying thicknesses to a depth of about 20 ft. The clay is underlain by weathered and unweathered shale to a final drilling depth of about 70 ft. Segment 1B-I-635/I-35 Interchange: Below the surface fill layer, the underlying soils include fat clay with sand and gravel inclusions of varying thicknesses to a depth of about 20 ft. The clay is underlain by weathered and unweathered shale to a final drilling depth of about 80 ft. Segment 2-West End of I-635: Below the surface fill layer, the underlying soils include fat and lean clay, with sand and gravel inclusions, of varying thicknesses to a depth of about 65 ft. The clay is underlain by highly weathered shale to a final drilling depth of about 105 ft. Segment 3-East End of I-635: Below the surface fill layer, the underlying soils include fat clay to a depth of about 5 ft, which is underlain by limestone with shaly inclusions to a final drilling depth of about 60 ft. The foundation design required a variety of processes, innovative problem solving, and many different types of equipment to deal with the varying conditions encountered in both the soil and on the job sites. Processed and cased drilled shafts are dominating the jobsites on the various segments; however, both rock and low clearance drilling are playing an important role in completing the project. As an example, at Segment I of the project at the I-635 and I-35E interchange, 84 in diameter cased drilled shafts socketed into the blue shale bearing stratum were required for the northbound ramp. The cased and total lengths of these shafts were 43 ft and 108 ft, respectively, which required both 150 ton and 50 ton cranes to lift and position the 32,700lb rebar cages into position. The concrete pour for each of these shafts was about 170cy. At the eastbound ramp, 96 in diameter cased drill shafts socketed into the blue shale bearing stratum were required. However, the cased and total lengths of these shafts were 35 ft and 68 ft, respectively, which necessitated the use of two cranes to lift and position the 27,600lb rebar cages into position. The concrete pour for each of these shafts was about 140cy. In several segments over the existing main lane traffic of I-635, cross street overpasses where designed. Construction of these overpasses could only be scheduled after the existing main lanes were removed and the existing grade elevation lowered 20 to 30 feet in some areas. The impact on the traveling public and the cost to provide equipment access for this sequence of work was unbearable. Thinking out of the box, Texas Shafts devised a solution that would allow for drilling from existing grade while maintaining traffic flow. Design engineers would go on to designate this procedure and “drilled columns” instead of drilled shafts. Essentially, the columns were excavated and constructed with the drilled shafts. The main concerns with this proposed method of construction was the location and verticality of the column. The liability to maintain zero tolerance on the location of these columns was enormous. If improperly constructed the future result could require an entire bridge to be replaced. This concern was only compounded while drilling with unstable ground conditions that required temporary casing to maintain side wall stability. Permanent casing was placed inside oversized temporary casing and used as a form for the column. This permanent casing was secured on location with a steel I beam template. Lasers were used to verify verticality and location. Concrete was poured monolithically or in stages as the site conditions warranted. Flexibility in the procedure was required when dealing with differing column dimensions, drill shaft diameters, and ground conditions. has enabled the general contractor to build several bridges out of sequence, opening up several areas to work, which has cut months off the scheduled completion date. One of Texas Shafts’ responsibilities was to install “crash rated” stab piling, which was imbedded about 6ft into the top of the drilled shaft immediately after the concrete was placed, and was later cast into the column when the column was formed and poured. Prior to concrete placement, a surveyed template was used tocenter the stab pile into the drilled shafts. Support braces were weld-ed to the stab pile and to the template for support and to assist in keeping the pile from moving while the concrete reached its initial set. Due to the limited jobsite access, the multiple traffic shutdowns needed to be coordinated with the crane lifts, and further challenges existed where right-of-way working areas closely bordered existing businesses. Solution: Sometimes utilizing as many as 12 drill rigs and service crane crews spread throughout the job, working days and sometimes nights. Texas Shafts, through their experienced personnel and capable equipment, were able to continually push the envelope of production while maintaining 100% commitment to safety and quality. Vertical reinforcement requirements in some cages called for double #11 vertical bars placed side-by-side. Drilled shafts over 60 ft in length required rebar cages to be lap spliced,and, with side-by-side double vertical bars through the lap lengths, resulted in 50% of the rebar cage diameter being solid steel. Concrete flow was realized as a potential problem. Solution: Doubleverticalbarswerestackedthroughthe lap length instead of side-by-side. This allowed for a 100% increase in the vertical bar spacing and aperture opening, allowing for increased concrete flow. 10 ft to 15 ft above the top of shaft (TOS) elevation, we were unable to excavate down to the TOS due to the close proximity to the adjacent existing roadway and to the existing water table, which was above the TOS elevation. Solution: Texas Shafts utilized multiple trench boxes, used varied casing length in the trench boxes to help locate the tool in the pipe, and used sump pumps around the clock to keep water out of the trench box. Some work areas with little or no access in highly congested traffic areas provided for critical safety hazards to both workers and the traveling public. Solution: Texas Shaft scheduled crews to work at night. With safety being the number one concern, this required extensive coordination with the General Contractor. Preparing and scheduling lane closures, traffic switches, placing concrete traffic barriers, and providing adequate lighting were all preplanned and scheduled to allow for these critical areas to be accessed safely at night. Since this job is a Design-Build project, engineers were involved daily, and thus able to realize any conflicts with existing underground utilities or obstructions relatively quickly. Rather than delay the job waiting for a utility relocation, engineers were able to redesign the foundations, as needed, to avoid the conflict. As a result, the diameter of many shafts was increased to as much as 120 in. Often times, modifications to construction procedures were required due to logistics and scheduling. Solution: Texas Shafts maintains both a large variety of equipment that facilitates the installation of just about any size drilled shaft on land or over water and an experienced management team capable of proposing workable solutions and follow through. Strong relationships built through many years in the ADSC helped to get through the most challenging and difficult of situations. Texas Shafts values participation from their close working relationships with fellow ADSC members to help get the job done. The following contributed in some way to the success of this project: Richard Goettle, Inc.; Dr. Tom Witherspoon; Dr. Dan Brown; Dr. Bill Isenhower; Mark McClelland; American Equipment & Fabricating; Kelly Tractor, Watson Drill Rigs; Voss Parts, DRILLTOOLS; Wylie Drilling, and Interstate Foundation. Working in low overhead conditions beneath live power lines and existing structures. Solution: Rather than wait for power lines to be relocated or existing structures to be demolished, Texas Shafts, with its diverse selection of versatile equipment and expertise in handling challenges, was able to work through the obstacles. This ability starts with a commitment to having a thoroughly trained and dedicated workforce. Throughout each year, Texas Shafts trains its employees on various subjects such as: ADSC Downhole Entry, OSHA 10 Hour Training, Drilled Shaft Competent Person Training, Recommended Procedures for Fall Protection, as well as first aid/cpr, hazmat, basic crane operations, crane rigging, and many other programs specific to each job. It is through the expertise of trained employees on the best equipment that enables Texas Shafts to overcome all jobsite challenges. Endless traffic congestion, demanding schedule, challenging design, difficult ground conditions, and low overhead obstructions have all been experienced on this project. Accordingly, a well thought out construction procedure and equipment program has been put into place by Texas Shafts. The challenges, both expected and unexpected, will continue to require Texas Shafts to be flexible and responsive to all situations in order to work safely, maintain quality, and stay on schedule throughout the duration of this project. 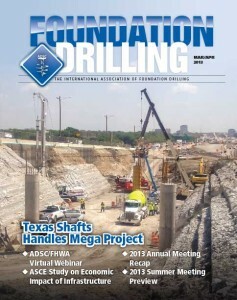 Ultimately, through the combination of a industrious, dedicated, and expert workforce, Texas Shafts is prepared for this challenge, which will produce a successful project for the owner, the engineers, the contractor, and, more importantly, the North Texas population that depends on the efficiency of this new infrastructure.